A bus with chains in a 2012 storm (Photo by Oran). Metro switched all bus service to snow routes by Monday afternoon. As of 2:30 on Monday, the agency planned to keep running snow routes “until further notice,” according to spokesperson Jeff Switzer. A live-updated list of each route’s status is available on Metro’s website, MetroWinter.com. Major trolley routes saw some trips cancelled, as Metro had to pull articulated trolleybuses of the road. Shorter trolley coaches are in service where possible, but the agency doesn’t run 60’ articulated trolleybuses in the snow. Articulated trolleybus trips have been replaced, where possible, with hybrid 60’ articulated coaches. “We have to cancel some trips spread across different parts of King County, different parts, to be able to maintain a certain level of service on those trips but not just pull all of the coaches into downtown Seattle. We try to work to keep a balance,” Switzer said. According to Switzer, Metro called in extra maintenance staff to bus bases on Sunday night, when snow started falling, to put chains on buses. “Overnight, we made the decision to proactively prechain the entire fleet in time for the morning service,” Switzer said. Metro will continue with extra maintenance shifts during the storm, and possibly for some time after, as using chains can damage coaches. Metro will look to return routes to normal service where possible, but King County’s varied topology and microclimates, and the storm itself, will dictate which routes will return to normal service and when. In the meantime, Switzer says Metro is coordinating with SDOT and other road agencies to keep arteries clear. “We’re just gonna keep on keeping on as best we can to keep service service on the road, and we’ll always be keeping our riders informed using rider alerts, transit alerts, and text messages, so people should really sign up for those on their favorite routes,” Switzer said. Even though the roads are clear in the area where I live we are still on snow route. So I cannot catch a bus. I really hope it is cleared by tomorrow. I need to go to see my doctor and if the buses are still an snow reroute I cannot go. With my disability I cannot walk to the snow route stop. Ride report from Ballard to Downtown: my usual bus was slightly more crowded than normal coming from and somewhat late (~8 minutes) but overall not too bad. Not much SOV traffic on the road. The chains make an extremely loud racket on bare pavement – or perhaps my bus had a broken set. They always make a loud racket. But, the racket is worse in the back of the bus, because that’s where the chains are. You can avoid some of it by sitting near the front. The chains also limit the bus to about 30 mph, even on a plowed freeway, where all the cars around it are doing 70. I ended up biking the 40 route from Ballard to SLU on Leary and Westlake due to the bicycle facilities being a sheet of ice. There were people waiting at every stop, up to 20 at the more popular stops. I didn’t see a single southbound 40 my entire ride. I heard the D Line wasn’t too bad, but that’s a result of more direct routing, with minimal turns. Why is Metro chaining buses when the main streets are plowed and clear? It’s absurd. Yes, it’s slick in spots but chains don’t help you go up or down a hill that’s covered in ice. Chains are for traction in compact snow and ice. Good to know roads like Aurora and Roosevelt are about to get chewed up by unnecessary chain damage. Well….Metro isn’t Seattle, but why would Metro care about any damage they cause to city streets? Street repair comes out of someone else’s budget, namely Seattle’s (SDOT’s)..
1) Metro often has to make decisions over a wide area that may affect a specific route or neighborhood less impacted. 2) Metro often has to make decisions well in advance with less accurate weather predictions than when you look out the window and make plans to go somewhere. 3) Just because a route is clear where you are doesn’t mean that ALL portions of the route are that clear and accessible. That is fine. As long as Metro pays for the damage they cause I’m OK with it. Metro is an essential public service, not a for-profit entity. Metro got huge amounts of flack for years for not being prepared for snow and some routes having three buses stuck somewhere. I used to live at 56th & University Way and in several snowstorms there were one or two 71/72/73Xs stuck a block away. Now the city has a list of streets it plows, and Metro put on chains if there’s the slightest chance of snow. That’s why buses have been more reliable the past couple snowstorms, This time Seattle did the most plowing I’ve ever seen, and Metro preinstalled chains to be ahead of the storm. Those two may have worked at cross-purposes, but we should thank them for getting so much ahead of things, because it could have been much worse and was until recently. The issue of too much chaining is a longer-term issue that the city and the county can figure out after the storms are over. I don’t see any ST tweets on Link today. I assume it is the only transit route running on time. And maybe some of the ferries. I get that these are special circumstances, but is Metro at least able to put signs up on the stops that are closed? I was on UW campus yesterday, and I had to lead some elderly folks from Stevens Way to Pacific because they didn’t know that the 75 wasn’t running through campus. So many stops are closed because of the reroutes that it would be almost impossible for Metro to start posting signs. When the roads improve then the buses return to their regular routes meaning that Metro would then have to go back and take down the signs. Right now Metro has all hands on deck to try to keep their service going and don’t have the personnel to start posting signs on closed bus stops. Don’t most stops have a route map that includes the snow route? The snow is the sign. The fact that there is snow or ice on the ground is a clue that a route may be on snow route. There are multiple ways to check if a route is on snow route. Sings require somebody to drive to the stop and put the sign up, and driving to the stop is precisely the problem. Arbitrarily-changing snow routes are another problem. If a bus switched back to regular route you may be waiting at a snow stop for a bus that never shows. That happened to me with a 75 last time. When I left home the 75 was on snow route, so I waited at UW Station but it didn’t come, so I took a 65 up to U Village, and there was the 75 on its regular route. There was still snow around so the landscape looks identical before and after Metro switches to regular route, so you can’t tell. What about stops with RTIS? Stops in my neck of the woods we’re showing bus times, but buses never came because they were using a snow route. Erroneous info is bad info. Nothing advised E riders that the bus was on a snow reroute. The RTIS should be operated from remotely accessed like they were when showing SR 99 closure info. No drive by required. The alerts section of the Trip Planner App would be the best place to put this but it isn’t there. When you put in 2 destinations for a trip, it should warn you of a trip change or reroute. On One bus Away, it actually showed a bus tracking near my stop. It was showing 3 minutes late. It was actually on a snow route 20 blocks away. I understand the frustration. On one bus away, I’ve had a bus route in green scheduled to arrive in a minute or two only to then disappear, not show up, then show up as arriving 45 minutes late. Very common w/ the 21 the past couple of days. I’ve always liked Community Transit’s solution: mark stops with a sticker if they wouldn’t be served during snow days. Wednesday morrning and most roads are clear. On their website, Metro says all Seattle operations are normal. But buses, or at least the 372 I was on, are still rerouted off UW campus. How would someone on campus know the stops are still closed? Video of radio host Dori Monson trying to help stuck Metro bus yesterday in front of station. Wow, MyNorthwest really went out of their way to try to make Dori a hero (a transit hero to boot! ), when in fact he did nothing and even with his coworkers were not likely to budge a bus stuck on an icy hill. I hope MyNW doesn’t strain their hand patting themselves on the back! Thank you, Dori, for helping demonstrate the utility of grade-separated passenger rail! There already is grade-separated rail between downtown and UW, but it was as effective as a stuck route 70, because nobody took it. The UW was closed and so were most businesses. It can’t be a utility if no one takes it. Sam. Voted the nation’s #1 transit commenter in Transit Commenter Magazine. Sam, Sam, Sam, making fact-free assumptions doesn’t become you. Yesterday you said nobody would ride Link because nobody was going to work. So I did ride Link just to spite you and to see how MLK was doing. I rode down to Othello at noon. The load was light but some people were apparently going to the airport. I tried to go to Olympic Express (an Asian restaurant) but it was closed, so then I walked to Rainier to take the 7 to Columbia City or Little Sigon. Myrtle Street was snowy, and it doesn’t go through so I turned down to Othello and saw a 50. MLK and Rainier were plowed; I don’t remember about Othello. At the Rainier & Othello stop I met a woman who was taking the bus “to shop for a Valentine’s gift for my daughter” or something like that. The 7 came soon (I don’t know how punctual it was), and it moved slowly because of chains. At least a dozen people were on the bus or got on before I got off at 12th & Jackson. I went to One Pot, then took the streetcar to Pine Street. The streetcar was fuller than I’ve ever seen it. (A few seats still empty.) So there. Sam, Sam, Sam, fact-free assertions are unbecoming of you. Yesterday you said nobody was riding Link because nobody was going to work. So I rode Link to spite you and to see how MLK was doing in the snow. I went to Othello at noon. The load was light but there were several people on it; some seemed to be going to the airport. At Othello the restaurant I was going to was closed, so I walked to Rainier to take the 7 to Columbia City or Little Saigon. I went on Myrtle Street which was snowy. It didn’t go through so I turned to Othello Street and saw a 50. MLK and Rainier were plowed; I don’t remember whether Othello was. At the Rainier & Othello stop I met a woman who said she was taking the bus “to shop for a Valentine’s gift” for somebody. The 7 came soon; it was slow because of chains. There were at least a dozen people on the bus or who got on the bus before I got off at 12th & Jackson. I went to another restaurant, then took the streetcar to Pine Street. The streetcar was the fullest I’ve ever seen. (A few seats still empty.) So there. Today I took a 75 from Campus Parkway. I don’t know if UW was open but there were still people wanting to take the bus to campus, who turned away when the driver said no buses were going to campus (they’re going around it). So somebody is going to UW in spite of the snow. I happen to be a route 75 expert, and I watched a lot of Columbo. So let’s take a look at your claim. You say you caught the 75 on Campus Parkway? The 75 originates as either a 31 or 32, and when on snow route, stays out on Pacific St when headed toward Northgate. It doesn’t even go on CPW when going west to east, only when going east to west. So if the 75 wouldn’t go through campus on Stevens, that means it’s still on snow route, which means you couldn’t catch it on CPW, only out on Pacific. Hmmm. Bzzt. The 31/32 came up to the Campus Parkway transfer point, which is on the 75’s snow route, and then went down 15th and Pacific to UW Station and up Montlake Blvd. The people trying to go to campus were at the Campus Parkway stop, and didn’t get on the bus when the driver said it was rerouted. Oh good people of STB, do you believe what I saw with my own eyes, or do you believe a Columbo expert who was prophesying from Kirkland or wherever he is? Metro alerts now says “some” routes are on snow route. Up in my neck of the woods (SW SnoCo)…. 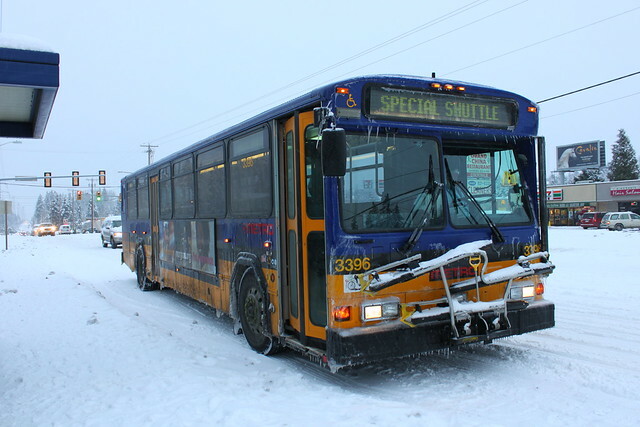 [NEW] All trips on Routes 413 & 512 to Seattle are running 30 minutes late due to icy road conditions. [NEW] Local buses are delayed 60-90 minutes. [NEW] Trips on the following routes have been canceled. Routes 109, 113, 116, 130, 201, 271, and Swift Blue Line. All buses are operating on Snow Routes (with some exceptions below). – Buses will arrive every 25-30 minutes due to road conditions. Additional specific route info then follows. Updated info can be found at the link. Either the 31/32 drivers didn’t get the memo about being on snow route, or the map on Metro’s website doesn’t have the right snow route for Wallingford. They’re *supposed* to run on Stone Way to 45th, before getting onto Wallingford, but were still using 35th. Either way, I submitted a complaint, which hopefully will get a response. From reading the above and from my observations, it appeared that KC Metro had some communication problems yesterday. It may be understandable, since it’s been a while since we’ve had quite so nasty a snow day, and much has occurred in that time. Communication about bus location, affecting both OBA and Metro’s own Bus Tracker. I noticed a potpourri of buses indicated which didn’t show up, buses not indicated which did show up, buses indicated on regular routes which were on snow routes, and at least one case of a bus indicated on snow route which was on regular route. Lots of buses failed to show up that were not marked cancelled on Bus Tracker. I believe OBA (and probably Metro’s Bus Tracker?) function in substantial part by matching actual buses to existing planned timetables for individual buses. If so, could much of the problem come from lack (or inaccuracy, or impossibility) of snow-route planned timetables? There used to be an application – I believe it was called BusDrone – which, as I understand it, just showed bus positions from raw GPS data, without fitting it into any scheme (or making any – ordinarily useful, not so much on snow days – predictions). If so, that (just display of unfiltered but comprehensive data on actual bus locations) would have been a very valuable tool yesterday. Communication about snow routes. Apparently some snow reroutes were different in reality than they were in the printed timetables (see above for the 31/32). It would be interesting to know if the reroutes on the snow-and-ice webpage matched reality or the printed timetable. In my neighborhood, snow routes were announced as lifted on twitter some 15 minutes before that lifting was indicated on the snow-and-ice webpage (meaning that the information people had to act upon differed depending on which official source they were using). Being required to guess which official source to use is not good. Metro might want to consider following CT’s practice noted above of placing a symbol on bus stop signs if that stop would be affected by snow reroutes. For stops (like Broadway and John east/west bound) where some buses are affected (like the 8) and some not affected (like the 10), it would be even better if the particular route(s) affected could be indicated. Communication with drivers about reroutes. In my neighborhood, nearly an hour after the twitter announcement that snow routes had been lifted, there was at least one bus which started out from its terminal on the snow route. Hopefully, Metro will think about how it could do better next time (which looks like it may be Saturday). …which was repeated Thursday morning.